Okay, so I’m well aware that last week’s blog post may not have painted me in the greatest of lights. That I came across as something of a hopeless unromantic oaf. I know this due to the admonishing looks and angry shakes of the head that I’ve received from some of my wives’ friends in the school playground during pick-up time this week. Yet fear not. This weekend I made amends for the errors of last week. For on Friday night I took my wife for a romantic night away to watch a show. Kid free! Not that this meant there was to be no groundhopping this weekend. Oh no! 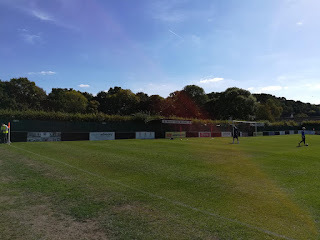 On the other half’s suggestion – yes, really – we decided that on the way home on Saturday afternoon we would stop off and visit a ground that I wouldn’t usually be able to get to due to travel logistics. Now I like to think that this offer was one born out of her undying love for me, yet I strongly suspect it was more likely a way she figured she could extend her time away from the children for a few more precious hours (we love them loads really). I’m fine with either reason behind her decision to be honest – so long as it means I get to watch more football. Before she had a chance to come to her senses and withdraw her kind offer, I quickly took to Twitter to ask the Twittersphere where I should go. Once it’s on Twitter, it’s legally binding, after all (pretty sure that’s right). After receiving four responses from people associated with different clubs in my required area, I then decided, for the second time this season, to put my destination to a public vote. 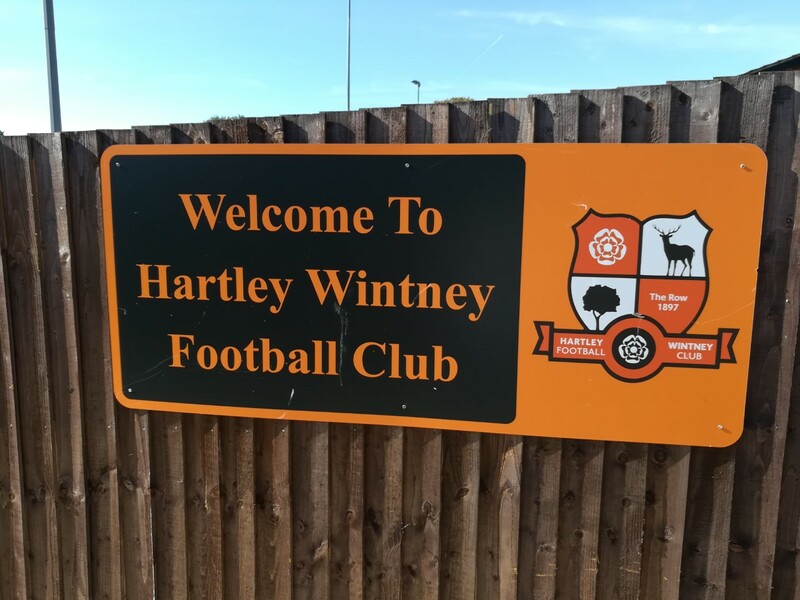 Two clubs in particular – Hartley Wintney and Abingdon Town – really got behind the poll to drive up votes for their club, and while it was close for a while between the two, it was ultimately Hartley Wintney that came out on top with 40 per cent of the vote. So it was that on our way back to East Sussex we stopped off in the delightful village of Hartley Wintney in north Hampshire, close to the Berkshire border, for their Southern League Premier Division match against Merthyr Town. With Hartley early league leaders and Merthyr just a point behind them, I was hopeful for a good match. My wife just seemed to be enjoying the peace of being child-free for a few extra hours. 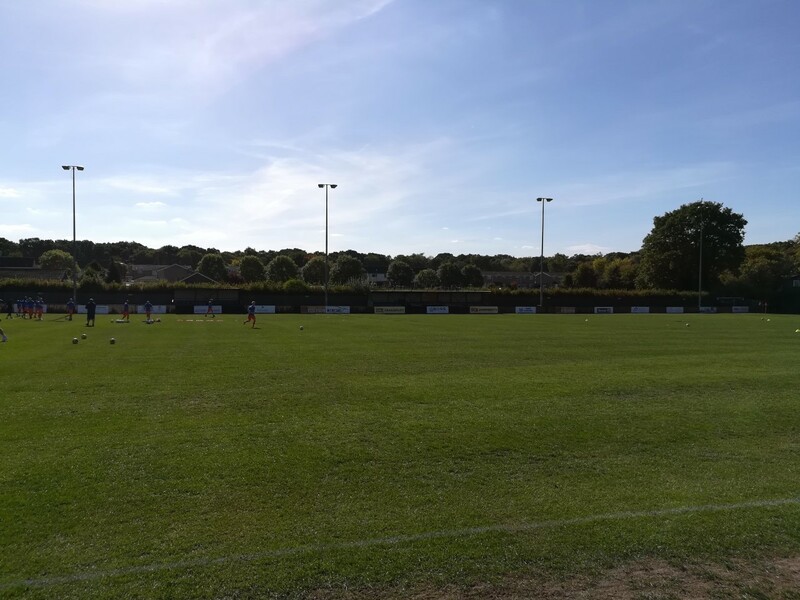 The Memorial Ground benefits from a sedate, picturesque setting within the village. Yet parking is plentiful and well laid out, with stewards to help. The early signs are that this is an extremely well-run club. They are signs that prove to be accurate. This is arguably one of the friendliest clubs I’ve been to thus far. From the moment we pay our entrance fee (£10 each) and buy our impressively put together program (£2) everyone we meet has a smile on their face and seem to be proud to be part of this rapidly growing club (they were part of the Combined Counties League just three seasons ago). To my surprise, while enjoying a quick pre-match drink in the well-appointed clubhouse, I’m recognised twice in quick succession, by two different members of the committee. They have been following the Twitter poll. One of them even says their child even remembers me visiting their school (Greenfields Junior) in my other guise as a children’s author – click here for more information about this – which is particularly satisfying. From the corner of my eye I catch my wife’s facial expression. ‘Don’t swell his head even bigger’, I can see her thinking. Too late. Before you know it, I’ll be swanning around Non-League grounds demanding a red carpet is laid out ahead of my visit, while bellowing ‘do you know who I am’ at the poor bewildered people manning the turnstiles. Or maybe not. Still it was great to speak to both, and only enhanced my positive feelings of this club. The ground looks great, but I am told it is still a work in progress having already undergone many changes in recent years as the club continue their ascent up the non-league pyramid. They have no fewer than five covered areas – two of which are seated – and there is plenty of space around the edge of the pitch for further development should the success continue. Unfortunately, the match did not prove to be quite the spectacle I had hoped it would be. 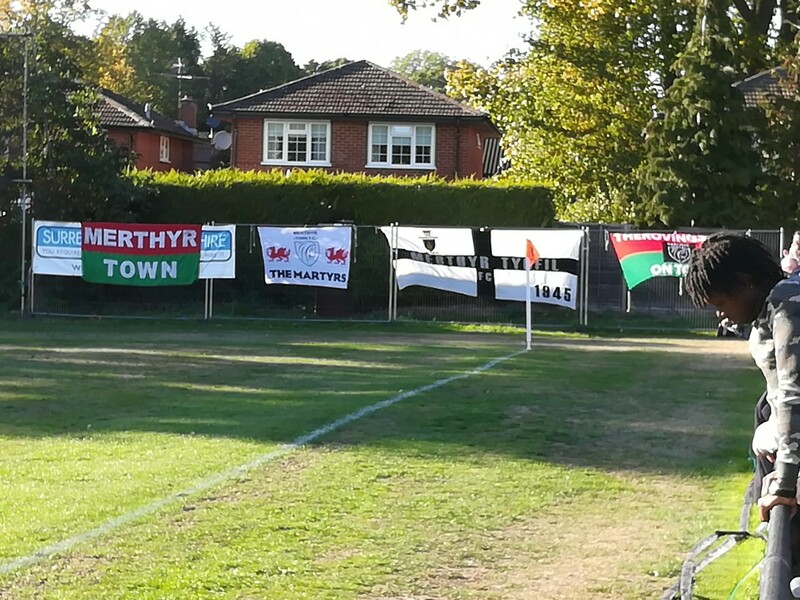 The first half was a scrappy affair with chances for both Hartley and Merthyr at a premium. It has to be said that the flow of the game was not helped by a fussy, whistle-happy ref who seemed to be happy to award free-kicks to the team that shouted loudest. The opening goal, which arrived after just ten minutes, was as scruffy as the game itself. Hartley keeper Adam Desbos could only punch the ball into the body of Merthyr forward Tom Meechan, and the ball rebounded off him and into the net past a crowd of hapless defenders. Merthyr greatly improved after the break and had a whole host of opportunities to extend their lead. 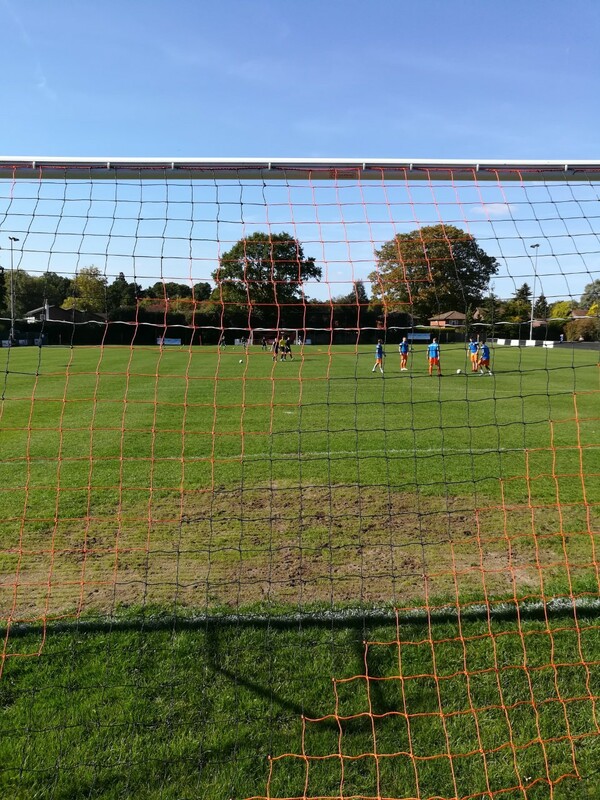 One has to feel that a second goal would have killed the game off, as Hartley Wintney were struggling to create many chances. It was hard to see them scoring one, let alone two. The best chance was shockingly missed by Merthyr’s skipper, Ashley Evans, who skied a shot from just six-yards out high over the bar after good work from Meechan. More chances came and went, but Hartley hung on doggedly to keep themselves in the game. 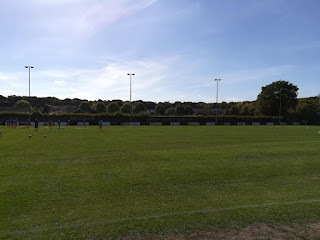 Five minutes of injury time had just been signalled when a clumsy challenge in the area on Hartley’s Nic Ciardini led to the host’s being awarded a late penalty. 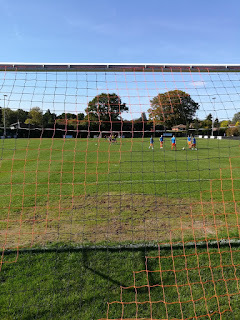 In fairness, a set-piece looked likely to be the only way Wintney would get themselves back in it, and so it proved, Ty Smith making no mistake from the spot (see video). It may not have been the top-of-the-table classic I was hoping for, but it was still a thoroughly enjoyable autumn afternoon spent in glorious late September sun, lovely surroundings and with friendly hosts. Even wifey said she loved it (and I’m sure she’s not being sarcastic… well not that sarcastic). 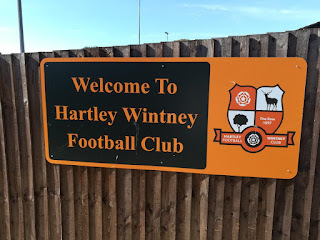 Great to read your positive impressions of Hartley Wintney FC. Not a classic game, but with the Martyrs having won 4 successive games on their travels, a point is a welcome return for our endeavours! The Row are proving hard to beat - as Weymouth, Farnborough and Merthyr have found - all sides making early strides for a top 6 place, come April. Do come back and see us again, when we will aim to produce more of a football feast! Hi Bill, I'm sure I will be back again as I really enjoyed the afternoon even though the game wasn't up to much. As you say, it's a results game, though, and I'm sure it will be a valuable point going forward, and will give your team another confidence boost. Good luck for the rest of the season.